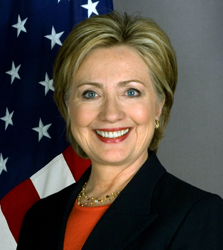 Hillary Clinton ran for the Democratic nomination in 2008, losing to eventual President Barack Obama, who then appointed her secretary of state. She is the consensus favorite to win the Democratic nomination. She announced her campaign in May 2015. Hillary Diane Rodham was born on Oct. 26, 1947, in Chicago to Hugh Ellsworth Rodham and Dorothy Emma Howell. Growing up in the Chicago suburbs, she got an early start to her political career, campaigning at the age of 13 for Richard Nixon and then Barry Goldwater in 1964. Raised as a conservative, she attended Wellesley College, where she became president of the Young Republicans. Her views shifted leftward in response to the civil rights movement and the Vietnam War, which she came to oppose, supporting the candidacy of antiwar Democrat Eugene McCarthy. In 1968, she left the Republican Party for good after attending the Republican National Convention. After graduating from Wellesley in 1969, Clinton entered Yale Law School, where she took an early interest in child advocacy. Throughout her law school career, she worked on various campaigns until 1971, when she met her future husband, Bill, and the two campaigned together on behalf of George McGovern’s failed 1972 presidential bid. Upon completing postgraduate study, Clinton joined her husband in Arkansas, a decision partly motivated by the fact she failed the District of Columbia bar exam and passed the bar in Arkansas. In 1975, the couple married (Clinton retained her maiden name of Rodham), and in 1976 Bill Clinton was elected attorney general. In 1979, Hillary Clinton became first lady of Arkansas following her husband’s election to the governorship. As Bill Clinton’s political star continued to rise, she took his last name to officially become Hillary Clinton. During the 1980s, she was able to use her position in the governor’s mansion to attract high-level clients to the Rose Law Firm, where she billed over $200,000 per year. The firm’s clients included Walmart and TCBY, and Hillary Clinton served on the board of directors for both companies. In 1992, Bill Clinton was elected president, and Hillary Clinton became a lightning rod as an activist campaigner and first lady. She generated controversy by criticizing women who “stayed home and baked cookies”2 and endured criticism for her willingness to parlay her husband’s political fortunes into personal gain. But she was also a powerful asset, and her “60 Minutes” appearance in the wake of the Gennifer Flowers scandal has been credited with salvaging his presidential bid. In 1993 Hillary Clinton was appointed to head the Task Force on National Health Care Reform. Her task force proposed a sweeping overhaul of American health policy that would provide universal health coverage by compelling employers to provide it to employees. This was the first concerted effort to pass a universal health care law, and it earned Clinton sweeping condemnation. Throughout the remainder of her husband’s presidency, Clinton would see a diminished role in advocating policy. After Bill Clinton’s tumultuous second term in office, in which he was impeached and confessed to marital infidelity, Hillary Clinton was elected to the U.S. Senate, replacing Daniel Patrick Moynihan. Weathering charges of carpetbagging (the Clintons had never lived in New York, nor had they been active in New York politics), she scored a 12-point victory over challenger Rick Lazio and became senator in 2001. In spite of a low-key tenure as senator, Clinton’s presidential ambitions were plain. After a landslide re-election victory, she transferred $10 million in funds toward her presidential campaign. In a bitter battle with Obama, who would eventually win the presidency, Clinton managed a split of the popular vote for the nomination, while Obama managed to accrue more delegates, especially the coveted superdelegates. Obama appointed Clinton to be secretary of state, a position she held until 2013. Like her Senate career, her tenure as secretary was largely unremarkable, save for the death of Osama bin Laden and gradual troop drawdowns in Iraq and Afghanistan, as well as the controversy surrounding the death of U.S. Ambassador Christopher Stevens, along with 3 other U.S. personnel, in Libya. Clinton and her husband have a daughter, Chelsea, a former television correspondent who now works for the Clinton Foundation and Clinton Global Initiative. According to former Defense Secretary Robert Gates, who served under Obama while Hillary Clinton was secretary of state, Clinton admitted that her opposition to the troop surge in Iraq was based on political concerns and her 2008 presidential campaign.18 Clinton has denied the charge, saying Gates misunderstood what she had said. Clinton is a capable and experienced speaker. She has spent more than two decades in the national spotlight and been the subject of often withering criticism from political opponents. With significant political experience dating back to at least the mid-’70s, Clinton may be the most experienced candidate in the 2016 cycle. By nearly all accounts she did very well in the first Democratic debate,19 showing skills and experience likely honed in more than two dozen debates during the 2008 campaign. In a moment indicative of Clinton’s zealotry and ambition, her staff crafted a “hit list” of politicians who had wronged her during her 2008 presidential bid; many observers suspect if she did not order this list created, it was certainly done in an environment she fostered.30 This may call into question her ability and willingness to bury the hatchet, much less work across party lines. When Sen. Claire McCaskill made a disparaging remark about Bill Clinton, Hillary Clinton instantly canceled a fundraiser she had planned for McCaskill. As a senator, Clinton voted against President George W. Bush’s major tax-cut packages.31 Once they were enacted, she did generally vote to extend many of the existing cuts. Clinton is on the record speaking of the benefits of fracking, though she favors regulating the practice.59 She nominally supports exporting natural gas and oil production and sees gas as a clean, job-creating alternative to coal. She reiterated her support for a “public option” in Obamacare, a government-run insurer that would compete with private insurance companies in the market.79 She supported this idea in her 2008 campaign as well. As a former secretary of state who was active in crafting foreign policy along with her husband during his presidency, Clinton certainly has significant foreign affairs experience. Even before her tenure as secretary, she served on the Armed Services Committee in the U.S. Senate. While she opposed many elements of the war on terrorism as a senator, she is generally thought to be more hawkish than most members of her party, having voted for military intervention in both Iraq and Afghanistan. Even within the Obama administration, Clinton was considered to take a relatively proactive posture on military efforts abroad.118 Clinton says Gates misunderstood her comments, which were describing the political difficulties of getting the American public to support a surge. She has also called for United Nations sanctions against Iran, and stated that the use of military force against that country should not be taken off the table. Clinton supported the Family Entertainment Protection Act,149 legislation that would regulate the video game industry for violent content. In the aftermath of the Bush v. Gore decision following the 2000 election, Clinton stated that the electoral college should be scrapped in favor of a national popular vote.156 She is also on the record asserting Congress ought to be more respectful of presidential authority. If opponents are looking for scandal to leverage against Hillary Clinton’s candidacy, they won’t have to look very far. Whitewater, travel office allegations, her time with Walmart and the Rose Law Firm, and any one of the myriad business dealings from her time as first lady of Arkansas could become a hot-button issue.